Singles Knockout winner - Denis Thompson. Doubles Knockout winners - Colin Stainthorpe & James Gilpin. Doubles Knockout runners up - Denis Thompson & Ryan Vasey. Heaviest Fish in a competition - Rob Allison - 12 lb 01½ oz (30th November 2008). 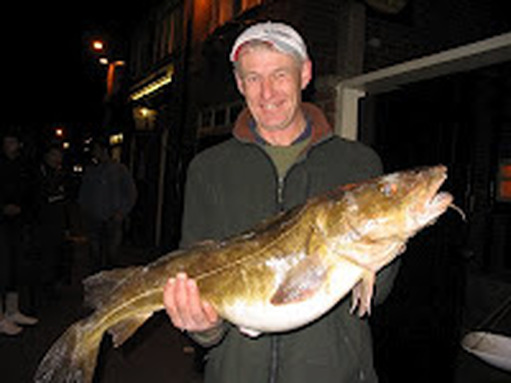 Heaviest Fish out of competition - Brian Harland - 8 lb 10 oz (18th November 2008). Christmas match winner - Colin Stainthorpe - 5 lb 13 oz 7 fish. Greatest number of fish - Brian Harland - 103 fish. Heaviest Bag of Fish - Denis Thompson - 28 lb 14 oz - 7 fish (12th November 2008). 1st - Ryan Vasey - 12 lb 09 oz - 11 fish. Junior Heaviest Bag - Ryan Vasey - 3 lb 09 oz. Junior Heaviest Fish - Ryan Vasey - 3 lb 09 oz. Total weight for the season - 1,136 lb 02 oz. Total Number of fish - 676. The start of a new season saw Whitby Sea Anglers turn out in favourable conditions. Brian Harland had a double win for the first two matches. Conditions not favourable with a very small flooding tide and flat calm seas. D. Perrett won the match with a mixed bag of flatties and eels. Again flat calm seas didn't help even though it was a low water match. D.Thompson won with 2 codlings for 5 lb. Wednesday 15th October - Singles knockouts. Near calm conditions and a big ebbing tide making fish scarce yet again. Denis Thompson continued his winning form taking the match with 2 fish for 4 lb 01 oz. A high water match strong s.w. winds, calms seas and fish scarce on the ground again. Colin Stainthorpe was the man in form to win his first match of the season with four billets for 6 lb 07 oz. Wednesday 22nd October - Doubles knockouts. A small flooding tide and light/moderate long distance swell in the water saw improved catches. Denis Thompson got back to his winning ways with 7 fish for 15 lb 02 oz including a nice fish of 7 lb 02 oz. Rob Allison found the fish with a fine bag of five for 17 lb 10 oz. A low water match good sea running and colour in the water everything in place for a good result. Fish were patchy though, but Rob Allison continued his winning form with 4 fish for 16 lb 01 oz. A high water ebb match, but with the Easterly movement clearing the water made for disappointing results. Ben Laws won his first match of the season with a mixed bag of Codlings and Rocklings with 7 fish for 7 lb 02 oz. Wednesday 5th November - Singles knockouts. A high water match with Easterly movement and wet conditions made fishing difficult with mostly Billets and Rocklings coming back to the scales. Rob Allison won with 2 fish for 3 lb 08 oz. A low water match calm conditions strong land winds and lashing rain made fishing difficult. This is reflected in the results. Wednesday 12th November - Doubles knockouts. What a difference a match makes! Again a low water match but with a light swell in the water. Denis Thompson won the match with the heaviest bag of the season so far an excellent 7 fish for 28 lb 14 oz including a fish of 7 lb 05 oz the heaviest in November so far. Sunday 16th November 2008 - Whitby Open members club results. 1st Brian Harland 3 fish for 6 lb 12 oz. 2nd Mike Vasey 3 fish for 6 lb 06 oz. 3rd = Colin Stainthorpe 2 fish for 5 lb 02 oz. 3rd = Paul Kilpatrick 2 fish for 5 lb 02 oz. 5th Rob Allison 1 fish for 4 lb 05 oz. 6th Ryan Vasey 1 fish for 3 lb 09 oz. 7th William Atkinson 1 fish for 3 lb 04 oz. 8th Ben Laws 1 fish for 3 lb 02 oz. 9th Denis Thompson 2 fish for 2 lb 12 oz. 10th Peter Horbury 1 fish for 1 lb 11 oz. Whitby sea anglers turned out to fish a high water match in a freshening westerly wind with a decent sea running. Rob Allison got back to winning form with 8 fish for 15 lb 03 oz. A low water match freshening w-nw wind saw Rob Allison make it two in a row with 3 fish for 12 lb 15 oz. Wednesday 26th November - Singles knockouts. A low water match with alight swell in the water. B. Vasey won his first match of the season with two fish for 13 lb 01 oz including a double of 11 lb the heaviest of the season so far. Bernard with his fish of 11 lb. Rob with his fish of 12 lb 01½ oz A high water ebb match decent swell in the water saw another double to the scales. This time it was Rob Allison with a fish of 12 lb 01½ oz beating Bernard to take the heaviest fish of the season title so far. It was part of a bag weighing in at 25 lb 01 oz. 11) C. Stainthorpe 6 oz (1). Wednesday 3rd December - Doubles knockouts. Fishing an ebb tide with a light/moderate swell in the water saw a hat-trick of doubles back at the scales. This time it was Brian Harland's turn with a fish of 11 lb 12 oz part of a bag of 4 for 19 lb 07 oz. A low water match with improved sea conditions should of seen more fish back at scales but results were disappointing given the conditions. Rob Allison won the match with 2 for 6 lb 15 oz. Whitby sea anglers turned out to fish the Cloughton Open. This was a heaviest fish match which was fished by 87 seniors and 2 juniors. The match was won by M. Hillaby with a fish of 7 lb 08 oz. Wednesday 17th December - Singles knockouts. A high water ebb match with calm conditions reflected in the results. Whitby Sea Anglers turned out to fish their annual Christmas match fished from 2pm-7pm. It was over low water with colour in the water but with only a very light swell. It was a well attended match with nearly a full turn out by club members. With the conditions not really in the anglers favour results were disappointing but Colin Stainthorpe managed 7 fish for 5 lb 13 oz to win the match and therefore the Christmas title 2008. Club members then retired to the middle Fleece pub where the landlord laid on hot food after a difficult day. New year new start, the Whitby Sea Anglers turned out to fish a flood tide with a moderate swell. Brian Harland got back to his winning ways with 5 fish for 12 lb 06 oz. A low water flood match with a good sea running expectations were high but results were disappointing to say the least with only 3 anglers coming back to the scales. Rob Allison found the fish though with 3 for 14 lb 01 oz to win the match. Whitby sea anglers turned out ton slightly improved conditions descent movement but a large ebbing tide.Again results disappointing with again only three anglers weighing in. Wednesday 21st January Low water flood, flat calm land winds and rain. Ben laws won with 3 for 3 lb 05 oz. Improved conditions, a low water match saw only a slight improvement in results. Phil Mead won the match with a single fish of 9 lb. Whitby Sea Anglers turned out to fish the inter-club event of the season the Bell Trophy. It was well attended with 77 anglers turning out to fish in worsening weather conditions. The winners of this years trophy were the Scarborough Rock Anglers. A small tide flooding calm conditions again poor results. A low water match decent swell in the water saw a slightly better weigh in than of late. B. Harland won the match with 2 fish for 5 lb 15 oz. Fishing an ebbing tide, decent swell running a few Codlings came back to the scales. Denis Thompson won the match with 2 fish for 6 lb 03 oz. Again when calm conditions prevail it makes an already difficult season even harder. February Again same old story this season I'm afraid most members scratching about. 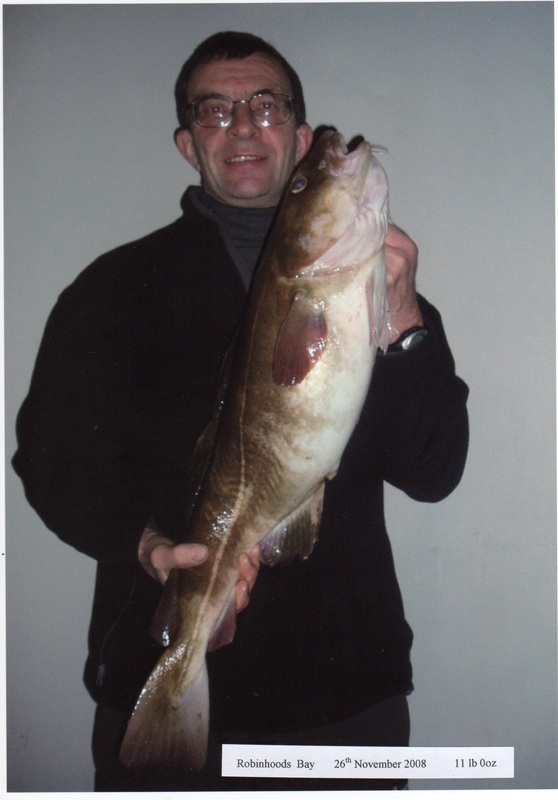 Denis Thompson found a codling though to win the match with 3 lb 02 oz. Mostly Whitings and Flatties came back to the scales. R.Allison won the match with 4 lb 11 oz (6). March A high water match fairly calm conditions again saw only whitings and flatties back at the scales. W.Atkinson took the match with 3 lb 08 oz (4). Fishing across high water alight swell in the water saw more anglers coming back to the scales with mostly flatties and whitings. D. Perrett won the match with 3 lb 07 oz (3). Fishing a flooding tide calm conditions only two anglers weighed-in. D. Perrett won the match with three Dogfish for 4 lb 12 oz. New member D. Hambley won the match with the heaviest fish of the month so far one of 4 lb 08 oz. D. Thompson took the match with 3 fish for 3 lb 04 oz. The last match of the season saw a dying sea fishing a high water ebb tide. The first three places looked as though they would remain unchanged, the main battle would be for the mid and lower positions. As it was not much was caught and the top eight trophy positions remained the same. The match was won by D.Thompson but it wasn't enough to catch this years champion Rob Allison. So it only remains to say congratulations Rob well won after a very difficult season. Saturday 2nd May end of season dinner and presentation. Whitby Sea Anglers turned out to the Cross Butts Stable restaurant for there annual presentation evening and dinner. It was well attended and many thanks go to the staff for a great evening. The presentation was given by the chairman Mr W. Atkinson and Martin Greaves of Whitby Angling Supplies. First round of the Singles knockout was fished on Wednesday 15th October 2008. D. Thompson bt A. Cass. Second round of the singles was fished on Wednesday 5th November 2008. C. Stainthorpe bt W. Atkinson. Singles Semi-final Wednesday 26th November 2008. P. Mead bt B. Laws. D. Thompson bt P. Mead. C. Stainthorpe & J. Gilpin v ? M. Vasey & B. Harland v ? R. Vasey & D. Thompson v ?